Assigned Calendar: Calendar that was selected when creating the Performance Measure (How often are the Performance Measures to be updated). Owner(s): Displays the Owners of the Performance Measures. Variance To Goal: The distance away from the Goal. Show Parents: Displays all of the scorecard objects for the Performance Measures such as Scorecard Name, Key Performance Areas, Objectives, etc. Show Sub-Metrics: Displays sub-metrics that reside under a metric. Impact: How much a scorecard object impacts the overall scorecard score. This is dependent on the weighting of each scorecard object. Actual Value: Displays the actual value for the period selected. Goal: Displays the Goal threshold for the Performance Measure. % of Goal: Displays the percentage the value is to the Goal. % Variance To Goal: Displays the percentage distance away from the Goal. Show Tags: Displays Tags that are created for the Performance Measure. You now have the option to go back and edit the report or save it. Click on Save and you will be asked to provide the report with a name. The application will provide a default name; you can delete this and give the report a name of your own choosing. The report will then appear in the list on the left of the screen. Select the Organisation you are interested in then select the Scorecard Object (we suggest you select a top-level Scorecard for this exercise). Click on Finished and you will be returned to the Red Performance Measure Report dialogue as shown further above. You now have the option to 1. Choose a new scorecard object, 2. Choose which columns you would like to see, 3. Create a chart or finally to save the report you can see. Click Save to save the report (you can always come back at a later date to change it) and give it a name. It too will be saved in the list. To recall a report, just click on the Report name in the list on the left hand side. To edit the report, click on the Edit button at the top of the report page. There are many other functions within Reports to create the reports you need. 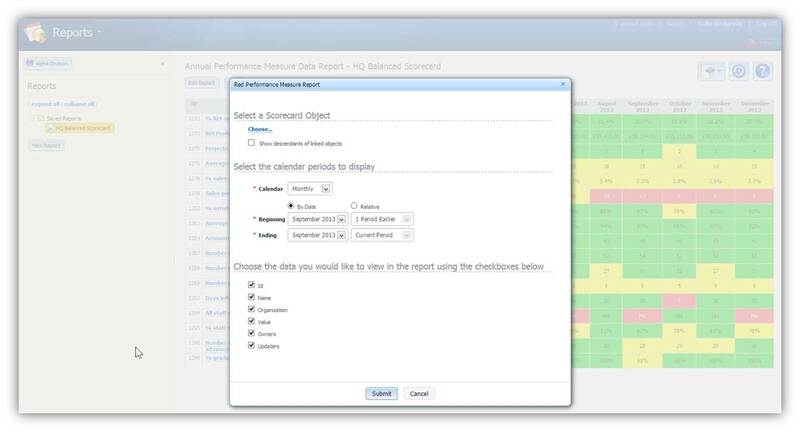 We suggest that you experiment with the standard reports first and then move on to use the advanced report writer.